I started taking swimming lessons the summer after I turned four and I took for the next two summers. It wasn't that I forgot how during the nine intervening months, I think my mother needed some place to deposit me on those summer mornings. I was a pest, and still am. As a four-year-old, getting in the water at 8:00 am was about as unpleasant as having your toenails yanked out with a pair of pliers. (Although I've never experienced that, I would imagine a trip to Vienna is a lot more pleasurable.) I remember how I cringed when the cold pool water hit my belly button. I loved my coach, Charlie Dyer; he really knew how to teach young children how to swim. When I was thirteen I developed lower-back spasms as a result of playing sports. Through the next few years when I got a smasm I knew what to do for it: medication, rest and walking around in a manner similar to a 317-year-old. When I was 21 I was doing situps on an incline (probably the dumbest thing someone with back trouble can do) and I ruptured a disk. Now I was walking like at 531-year-old; actually, I don't think I resembled the stature of modern-day man. I had to have not one, but two back surgeries; the first one, they removed the ruptured part of the disk, which wasn't successful, so a year later they had to go back in, remove the rest of the disk and fuse the two vertebra with bone from my hip. This was worse than having your toenails removed with pliers. The surgeon told me I could no longer run. I was in no shape to prove him wrong, so I jumped in the water. I LOVED IT! The water itself is theraputic. To this day, when I've finished my swim, which could be as long as 3,500 yards (two miles,) NOTHING gets in my way. From time to time i see my fellow members of the health club who normally run, next to me in the pool while they're recuperating from a running injury. Funny thing, they usually go back to running. Not for me. I swim at Cooper Fitness Center in Dallas, Texas, where aerobics was "invented." As an adult, I had the fortunate experience of being coached by one of the world's finest: the late Jerry Heidenreich, who won two gold metals in the 1972 Olympics. Swimming is all technique-oriented, and Jerry taught me to reduce my stroke count. When I started swimming for him, my stroke count was 23 for a 25-meter pool; to this day I keep my stroke count down to 16, thanks to Jerry. 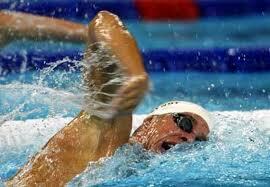 It's all about distance per stroke; it makes you less tired if you're taking less strokes. However, I only use my arms when I swim, as I never kick; Jerry once told me I couldn't kick myself out of a wet paper bag. Made me feel real special. Swimming became such a passion and large part of my life, I decided to use it and give back. For nine years I was a swim coach for Special Olympics. I love teaching people and I love helping those who aren't in a position to help themselves. Do this taught me to have a lot of patience; however, I still could use a ton more. I pray for what patience I have. There was not a Monday night in those nine years that I left the pool and didn't learn something. As I reflect on the experience, I realize how fortunate I am and how a smile can really brighten a person's day. My athletes were ALWAYS smiling. Swimming is one of the best forms of exercise as it's passive resistance; there's no undue pressure on any part of your body. It is indeed a lifetime sport. I hope to be swimming until my final days. Have you ever considered swimming as a form of exercise?